Custom E-commerce solution for Suzuki Canada. This extensive and ongoing project included integration and automation of warehouse inventory systems as well as parts, accessory and product search systems. Suzuki Canada approached us with a unique challenge : to separate from being integrated into the Suzuki America website in order to provide more autonomy as well as to establish a sales channel catered to people living across Canada. 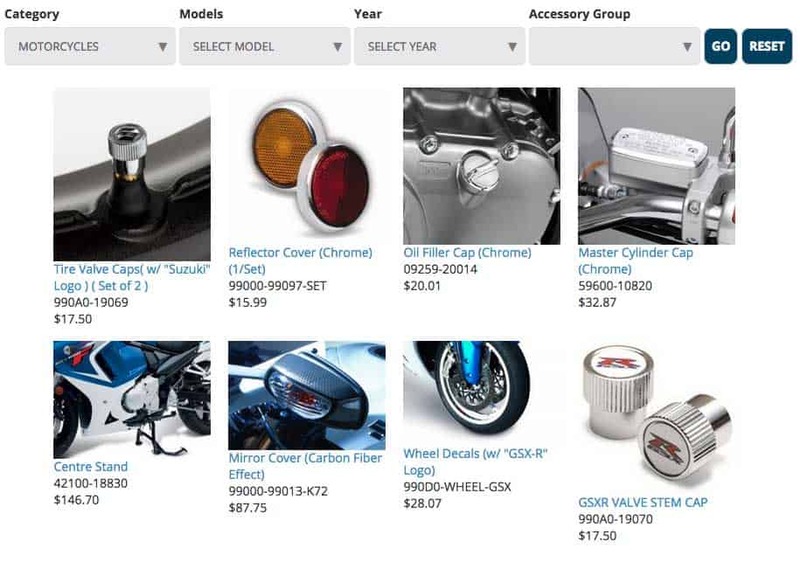 Migrating thousands of parts, accessories and products into a customized Drupal solution was developed as part of the broader migration strategy. We worked closely with the different teams and departments within Suzuki to establish migration paths which included automation and scripting solutions to alleviate the potential extensive amount of manual intervention that would be required to migrate the massive amount of data to the Drupal platform. Through the work over the lifetime of this project, we were able to contribute back to the Drupal community. The challenges with automation and dealing with multiple editors and constantly evolving content motivated us to create several drupal modules to improve on the database efficiency and speed of the website as well as to import and export unique content on a large scale. When the primary data migration and site launch was getting closer, both us and the client realized that it was going to be a significant challenge for end-users to actually sift through the thousands of parts, accessories and products in order to find what they are looking for. This motivated us to find a solution that was easy to use and allowed for a simple filtration system without having to modify the large amount of data that already was propagated within the database. We ended up creating a self populating ajax based dropdown system. The preceding choices made in a series of drop downs would ultimately auto populate the successive drop down content.